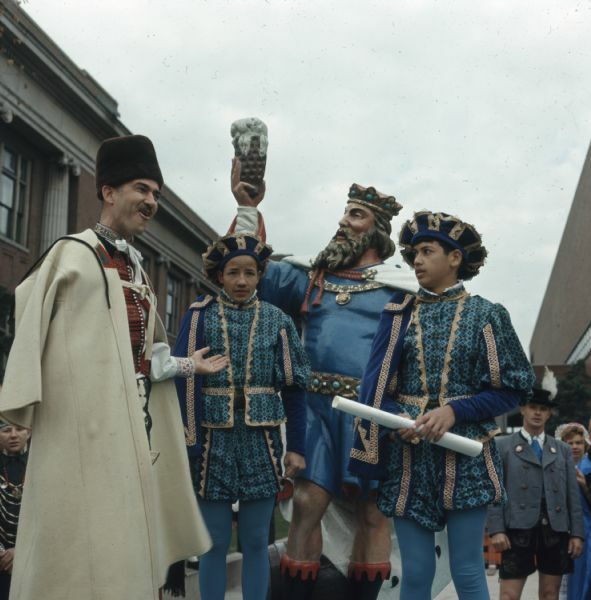 A man wearing Medieval European clothing is gesturing towards a statue of King Gambrinus on a parade float at the Holiday Folk Fair. Two boys, in matching Medieval European outfits, are standing on either side of the statue. One boy is holding a scroll. Other people in various ethnic dress are standing around the float. King Gambrinus was a king of Flanders, and has since become an unofficial patron saint of beer and brewing.